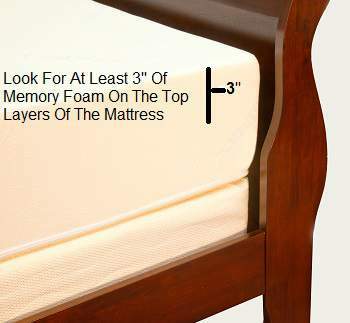 With a mattress, you should look for at least 3 inches of medium to high density memory foam. 3 inches of memory foam gives you a proper amount of material to cushion and conform to your body. While you could get by with 2 inches of memory foam in a mattress, 3 inches is plusher and a more comfortable feel for most people. It's a nice depth of foam where you wouldn't sink uncomfortably into the bed or lose the support of the base foam. I've seen memory foam mattresses that offer much thicker memory foam layers and they feel too cushy - you get sucked in, and adjusting from side to side can be a real problem. And you just don't have the same support for your body and back as you would with memory foam mattresses that are 3 inches or so of memory foam depth. Our 10" Memory Foam Mattress offers 4 inches of memory foam, and we've had a great response from customers on their feel and comfort. As for densities of memory foam used in a mattress, for a long time I've often heard from customers that they liked the feel of the "less dense memory foams" (memory foams 4 lb density or so, or what I refer to as medium density memory foams) better than that of the high density memory foam of the "leading brand" (memory foam of 5 lb or greater density). That was because people felt these "medium density memory foams" had a softer, more user friendly feel while the higher density memory foams could feel stiff and could be difficult to move around in. Lately, I've been seeing some memory foam mattresses coming out with even lower density memory foams in their layering (by this, I mean memory foams of 3 lb density and lower). Personally, I still like the feel of the 4 lb density memory foams over the 3 lb memory foam. And also at these lower densities I think you need to ask about that particular foams durability and comfort. 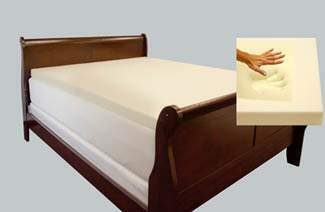 If you are looking for a memory foam topper pad to put on your mattress, you have many options. In general, you will pay more for a higher pound density memory foam pad - it just costs more to produce denser memory foam. Which ones do we recommend? We've looked at many topper pads, and we feel the 4 lb memory foam we decided to use in our Memory Foam Topper Pads just had the nicest feel and get great ratings and reviews from our customers. Often a 2" pad is sufficient for making a mattress much more comfortable, but we decided to offer a 3" version, as well, for those looking for a plusher feel. We've tested the 5 lb density pads, but decided not to carry them because they really didn't offer any more comfort than our 4 lb pad - in fact, the 4 lb pads were softer and had a nicer feel to them. We've found that our 4 lb memory foam pads perform very well and really offer a softer feel than denser memory foam pads. In our experience, they really do offer the best value for the money. This is a question we get all the time, and not an easy one to answer. In general, though, if your mattress is basically in good shape -- still firm and supportive, no indented areas or dips in the mattress, etc. -- but not as comfortable as you would like (looking for a softer feel, less aches and pains in the morning, etc), then a memory foam mattress topper pad may well do the job. On the other hand, if your mattress is too soft, rock hard, or has compressed areas, dips or a hammock feel, etc., then you are better off buying a new mattress - a topper pad just can't help with these problems.